Why is my computer slow? How can I speed up my PC? It is important to run your computer at peak performance. Over time, regular use of your computer builds up unneeded files and fragments your hard disk. Bad computer habits also contribute to computer slowness. Using multiple programs at once, putting the computer to sleep instead of regularly restarting, browsing the Internet with multiple browser windows, adding plug-ins and services, and neglecting to perform regular maintenance. These all can add up to poor computer performance. Norton can help with many of these. Follow these steps to have Norton optimize your computer. In the Norton window, double-click Performance, and then click Startup Manager. In the Startup Manager window, under Delay Start, select the program that you want to delay. If you are not sure which programs to delay, review the result under Resource Usage. If a program has high resource usage, we recommend that you add it to Delay Start. Over time, your hard disk becomes fragmented. Optimizing your computer's permanent disks can improve performance and reliability. Norton automatically checks your permanent disks for fragmentation and optimizes them if they are more than 10 percent fragmented. In the main window, double-click Performance, and then click Optimize Disk. Norton File Cleanup removes the temporary files for Internet Explorer and Mozilla Firefox and unwanted files from the Windows Temporary folder. Over time, temporary files can slow down Internet browsing and computer performance. In the Norton window, double-click Performance, and then click File Cleanup. After the temporary files are removed, click Close. To remove temporary Internet files on Google Chrome, continue to the next line. If you do not have Google Chrome installed, skip to Step 4. To open the Clear browsing data window on Google Chrome, press the Ctrl + Shift + Del keys on your keyboard. In the Clear browsing data window, at the top, from the drop-down menu, select the beginning of time. The options are selected by default in the window. Click Clear browsing data. Each security software is designed to work independently on a computer. Multiple security solutions on a computer are generally not optimized to work together, resulting in performance degradation. In the list of currently installed programs, select the non-Norton security product, and then click Uninstall or Remove. You can also read the program documentation or contact the program manufacturer for instructions to remove a non-Norton security product from your computer. There can be many causes for slowness in Internet connectivity. First, make sure that you receive the speed that was offered to you by the service provider. You can also have slow Internet performance if you have multiple browser windows open or a weak WiFi signal. Check to make sure these are not the problem. Once you have confirmed that none of these things are the problem, check to see if a browser add-on is causing slowness. Unwanted add-ons on your browser may affect the browser load time. We recommend that you disable add-ons one at a time and find out which add-on causes the slowdown. For Internet Explorer: On the Tools menu, click Manage add-ons. For Mozilla Firefox: On the top-right corner, click the Open menu icon, and click Add-ons. In the Add-ons Manager page, select Extensions. For Google Chrome: On the top-right corner, click the Customize and control Google Chrome icon, and click Settings. Under Chrome, click Extensions. Select the add-ons one at a time and disable them. If the Internet slows down after adding a particular add-on, then keep it disabled. There are several reasons that can cause your programs to start or run slowly. Norton can help you with some of the causes. Before you try anything else, restart your computer. It is recommended that you restart your computer daily to keep your computer running smoothly. From virus infection to conflicting startup items to multiple third-party security products, there are several reasons that can cause your computer to start slowly. Norton can help you with some of the causes and reduce your computer startup time. Does Norton interfere while I play games? Norton does not slow down your computer when you play a game, instead it suspends its alerts and background tasks so that there is minimal impact on computer performance. Wondering why your PC runs slow? 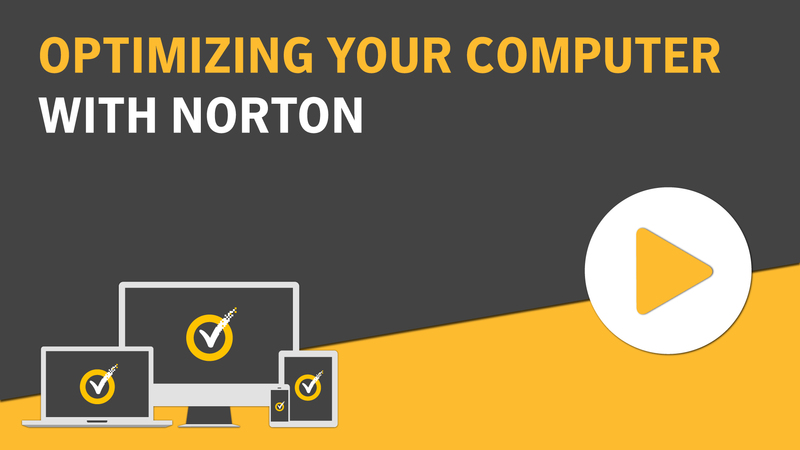 With the Norton Computer Tune Up service, our experts help to optimize your PC settings to improve startup speed and restores like-new performance to your older computer.